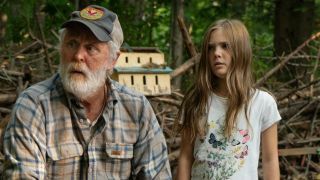 "I found something a little silly about a three-year-old running around with a scalpel"
Pet Sematary is one of Stephen King's most well-known works, and the 1989 adaptation of his novel is carved into the memory of many a horror fan, so as soon as we saw a trailer for the 2019 reboot we knew things had changed. Key parts of the plot have had a makeover, and in the new issue of SFX magazine executive producer Lorenzo di Bonaventura explains why. Mild spoilers ahead if you haven't seen the trailer, or ever read the book. "We were hoping you could hide the change – so if you were a fan, you were shocked at who got killed. But of course, marketing then says you’ve got to show it! ", di Bonaventura told us. So fans who see the 2019 reboot will know that unlike the original book (and movie), it's not toddler Gabe that dies at the beginning of the book, but older sister Ellie. "I found something a little silly about a three-year-old running around with a scalpel," says di Bonaventura. "When I started thinking, 'How are we going to get this three-year-old to physically do what we want?’ I was like, there’s a credibility issue in terms of the danger it can bring." Even fans of the 1989 movie have to admit that the image of cute little Gabe toddling around under six inches of eye shadow and hair gel is a strange moment for the movie, so the shake up is exciting. Di Bonaventura explains it also allows for a more nuanced portrayal of the grief-driven horror. "The fundamental reason was that to get into the heavier themes, so an older child can have the conversation," he says. "Say there’s a conversation between [dad] Louis and [friendly neighbor] Jud; there’s a cognisance that the older child understands the thematics you’re having the conversation about. Having a more developed human being as part of it allowed us to get more into the themes of death and, "What’s a parent supposed to do?'" You can read more about the movie, which is released in movie theaters next week, in the latest issue of SFX.